A Queen she certainly is - graceful, elegant and beautiful - Her Majesty Queen Silvia of Sweden, who was recently in Thailand with King Carl XVI Gustaf. 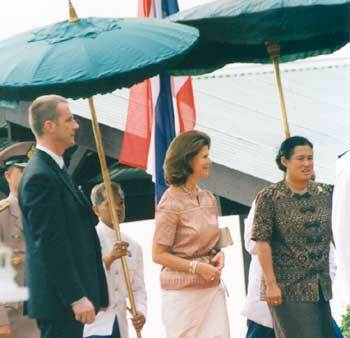 The Royal Swedish couple were on a state visit as guests of their Majesties King Bhumibol and Queen Sirikit. It was actually the King’s second visit to Thailand in two months, having come to Sattahip as President of the World Scouts Federation, to the 20th World Scout Jamboree in February. The Queen and the Princess arrive at the Kredtrakarn Centre. Greeted by the Centre staff at the pier. The Queen and the Princess talk to one of the girls. Among her many visits, Queen Silvia, accompanied by HRH Princess Maha Chakri Sirindhorn, went to the Kredtrakarn Protection and Occupational Centre, better known simply as the Kredtrakarn Home, in Nonthaburi Province. Influenced by her determination to promote better living conditions for children the world over, the Queen established the World Childhood Foundation in 1999. Her dedication to helping children with disabilities, promoting campaigns for fighting commercial sexual exploitation of women and children and advocating child rights, is legendary. The United Nations Children’s Fund (UNICEF) office in Thailand, dedicated to similar ideals, followed closely the Queen’s wish, knowing that she was anxious to visit Kredtrakarn - a ‘safe house’, also supported by UNICEF. 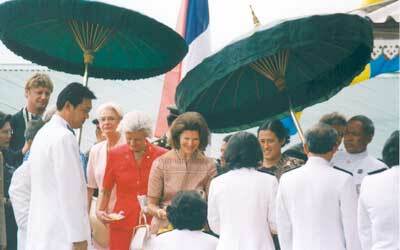 The Queen, the Princess and their entourage arrived at the pier on the Chao Phraya River, to be greeted by H.E. Anurak Juremas, and Khun Panit Nitithanprapas, the minister and permanent secretary, respectively, of Social Development and Human Security, H.E. Chanchai Sonthornmat, governor of Nonthaburi Province, Khun Wanlop Phloytabtim, director-general of the Department of Social Welfare, ministry officials, management and staff of the Home and, of course, UNICEF representatives. The Queen and Princess Maha Chakri were entirely engrossed in the activities of the Centre, particularly in the vocational training aimed at rehabilitating the girls and women. As they strolled, quite casually, around the different areas of the Centre, they conversed animatedly, stopped to view the work, talk to the girls and, of course, to sample the products from the cooking school. Nothing escaped Her Majesty’s attention, as she minutely examined the artefacts being made, observed the hairdressing classes, the batik painting, weaving and the wickerwork. The Queen herself was the epitome of elegance, wearing - most appropriately for the occasion - a beautiful Mudmee blouse of a sandy brown and a long dress of silver-grey. Of course, Her Majesty stopped a long time at the dressmaking school. An animated moment between the two Royal families. UNICEF staff (far left) pose with the Centre’s management personnel. The girls were mesmerized by the Queen and were equally delighted to see their own Princess Maha Chakri Sirindhorn close-up and be able to talk to them. It was a most heart-warming sight to see the happiness radiating from all parts of the Centre. The Queen, for her part, was also visibly moved by the sea of smiling, innocent faces which greeted her and the Princess all throughout the visit, reflecting her aims for the World Childhood Foundation. The Kredtrakarn Home was established in 1960 and is now under the supervision of the Royal Thai Government Department of Social Development and Welfare, in the Ministry of Social Development and Human Security. The main objective of the Home is to provide recovery and re-integration services for and the protection of women facing social problems, as well as rendering assistance to women and children, both Thai and foreign, who are victims of sexual abuse and trafficking in whatever forms they take. The Home provides accommodation, medical care, psychosocial recovery programmes, counselling, English language training and non-formal education. It also presents nine vocational training courses, to enable the girls to develop skills and attain knowledge which will help them after they leave the Centre. At the time of the Queen’s visit, there was a total of 237 residents at the Home, comprising 139 Thais and 98 foreigners, principally Burmese, Chinese and Laotian girls and women. HM Queen Silvia, understandably, within the context of her concerns for the welfare of children around the world, made a visit to the Kredtrakarn Centre a highlight of her time in Thailand. 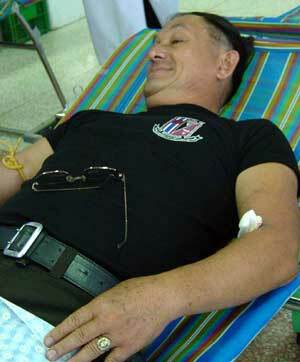 Dr Wutikrai Mungmai, chief of the Chiang Mai Provincial Public Health Office, said that they had arranged donations to celebrate Her Royal Highness Princess Maha Chakri Sirindhorn’s birthday on April 2, and invited people to join the celebration by donating blood at the National Blood Service Center. 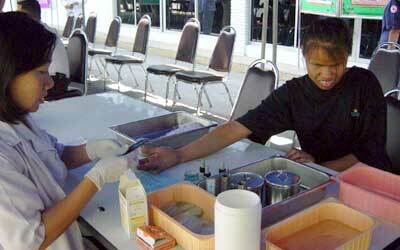 Another blind man donates blood to honor Her Royal Highness Princess Maha Chakri Sirindhorn’s birthday. Miss Pai Pota, a blind woman, awaits her blood type results. A man smiles, showing how proud he is after making good merit. 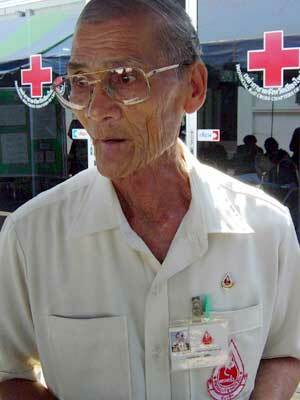 Cha-oom Sukpinit, a 73 year old counselor for the Blood Donation Club has given blood 109 times. Amongst the donors were five blind people from the Occupation Promotion for the Blind Club. “I just really want to help save people’s lives and I’m so proud when I realize that my blood is so useful for people who need it,” said blind Pai Pota. 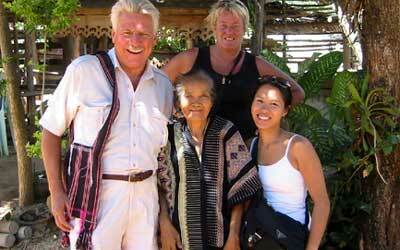 At the Karen Village (L to R) Alan Crawford, Karen tribeswoman, Judy Weber. 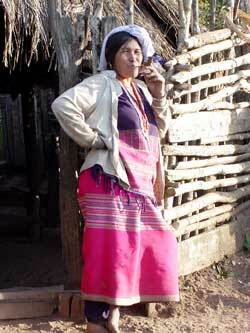 Woman smoking pipe at mountain tribe village where we entertained locals. In the long tail on the way to Karen village (L to R) Norachai, Nancy Paez, Alan Crawford, boatman, Cliff Bamford, Judy Weber. By this measure, our small band had a most excellent adventure a little while ago. It started one morning at breakfast in the tranquil, handsome and profoundly comfortable guest home ‘Jaiya Mongkol B & B’ of Norachai Prasertmanukitch in the Hangdong neighborhood of Chiang Mai. 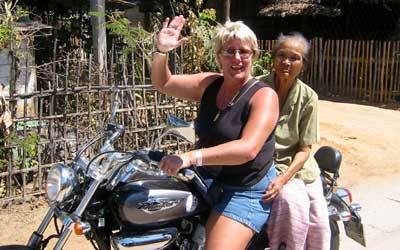 Judy Weber, Nancy Paez, Alan Crawford and I had decided to take a motorcycle trip to see “the real” north of Thailand. We debated our options: should we head towards Fang, circling back through Chiang Rai? No, that way would involve encountering too many tourists (like ourselves). 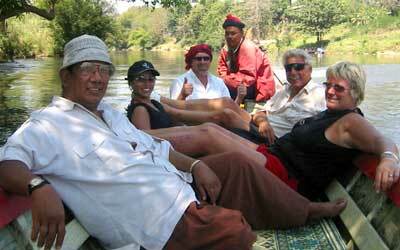 How about heading west, over the tallest mountains in Thailand, towards the Burma border? 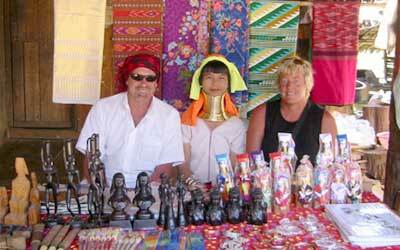 We might wind up visiting some of the long-necked Karen tribes that have relocated there. When our newly elected board chairman Norachai mentioned that he’d accompany us on the latter route, the decision made itself. We were headed for the mountains. So off we went, to Jaguar Motorbike Rentals near the downtown moat (whom we chose because their equipment was in great shape and because they were fair and honest about the inevitable repairs attendant to a trip of this type). Since the first part of the journey was on paved roads, we decided against dirt bikes, and chose street Phantoms plus a crotch rocket. This may have been a mistake. Anyway, we departed, with a confidence and savoir-faire begotten of a nearly total ignorance of what awaited us. Three motorcycles plus a proper four-wheel drive support vehicle, driven by the miraculously talented Choo, our guide and driver who was to come to our rescue in a profusion of senses before the trip was through. Through pure luck and Norachai’s help, he had organized a proper caravan for a proper expedition. Alan Crawford intruding on the workday of a weaver at the Municipal Crafts center. This is the team having breakfast at Norachai’s house. (L to R) Judy Weber, Cliff Bamford, Norachai, Nancy Paez, Alan Crawford. 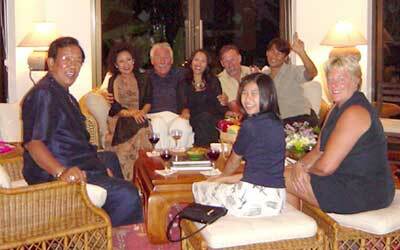 Celebration of our safe return at Chiang Mai Regent (L to R) Norachai, his wife Moon, Cliff Bamford, Nancy Paez, Alan Crawford, Norachai’s daughter Eve, Choo the guide, Judy Weber. The first part was heaven. Smooth roads twisted higher and higher, away from traffic and the humdrum, until we were each caught in a sort of two-wheeled ballet whose rhythm was set by the ceaseless curves of the beckoning road. 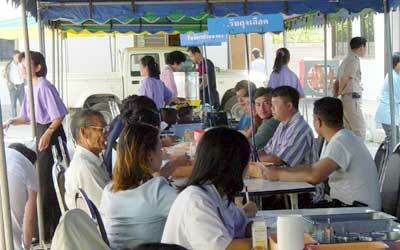 Eventually, we stopped for lunch in Mae Jam. On the way, we passed an ancient hill tribe woman who had spent many of her 70+ years weaving intricate designs into dresses, saris, and other fabric creations. She was old, but she still had a great sense of humor. Judy was looking at a tiny embroidered blouse as a gift for her niece. The old woman said, “If you can fit into that, you can have it for free”. We then persuaded the old woman to hop on the back of Judy’s chopper and drove her in high style 100 meters down the road, where we were the very first customers in a new community crafts center. Alan sat down at a rickety wooden loom and started helping the woman who was weaving there, to a chorus of giggles from her co-workers. Both Alan and I bought traditional turbans, but our heads were farang size and the turbans were not, so we wound up looking a little like deranged middle-aged pirates. Afterwards, Choo commandeered the kitchen of a local restaurant, cooked an excellent meal, and served us with his trademark song of “please enjoy your dinner.” And we hit the road again. Or rather the road started hitting us. We had left the smooth pavement and relative sanity of Route 1009 and chosen a secondary road though the mountains. Before long, we discovered a new and surprising natural resource that none of us had read about in any of our guides to Thailand: talcum powder. Or something very close to it, in some places a fifth of a meter deep, covering the road. For miles and miles and miles. To ride behind one of the other bikes was to enter a featureless and endless beige world of choking dust that found its way into places where dust should never be. One example was the hermetically sealed rear luggage compartment of our four-wheel drive backup vehicle. The dust had stolen in there in such quantities that our belongings looked more like an emotionally disturbed sand dune than anything resembling luggage. But onward we pressed, until we reached a remote hill tribe village near Mae Lana. We were the first farangs that had passed through that spot for four months. We handed out treats to the children, and Choo proceeded to change the flat tire on the Jeep. It didn’t take long for a small crowd to gather. 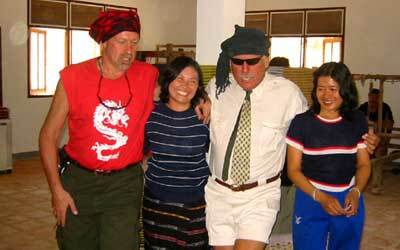 We had expected to find and observe tribal people living in their traditional ways. Instead, we were the ones being observed. Since we were intruding into the lives of these villagers, we thought it only fair to pay for our passage by entertaining our hosts. Alan and I tried our hand at juggling. Nancy did a fine choreographed rendition of “Singing in the Rain”, using a palm frond as an umbrella. Stuff like that. We are not sure how well this bit of spontaneous theater was received by the local critics. There is a good chance that they thought we were all escapees from some distant loony bin. In a sense they were right. So onward we went, as the roads became more and more challenging. At one point I was faced with two deep mud puddles with a 10-centimeter gelatinous glob of some dirt-like substance between them. I elected the gelatinous glob, since there was less uncertainty about its depth. Instantly I was up to my wheel hubs in mud the consistency of spackle. My bike fell over, in slow motion, so I could savor every moment of panic. Judy Weber takes the weaver lady for a ride to the Municipal Crafts Center. Arriving at the village where we entertained the locals - This is Choo discovering the road dust has invaded everywhere. Fooling around at the Municipal Crafts Center - disguised as deranged pirates (L to R) Alan Crawford, a weaver, Cliff Bamford, another weaver. Meanwhile, Alan was riding behind me, prepared for just such an eventuality, since he was by far the most expert dirt biker among us. Rushing to assist me, Alan laid his bike gently down on the side of the road. Unfortunately, the road had no side at that particular point - it just had an edge. So the motorcycle started what could have been a long journey down the side of the mountain. A few branches and vines stopped its descent a meter or so down the cliff face. We managed to manhandle the bike back onto the road. From then on, Alan had no front brake. And we still had the downhill part of the mountain awaiting us. Oh well. A little while later, the clutch on Judy’s bike decided that enough was enough. Our friend and guide Choo would push this very heavy bike up every hill, over rough roads, until it had a little momentum, at which he would jump on and ride for 50 meters or so, to the next hill. Choo eventually tired of this game after he had been playing it for a couple of hours. We came to a wide spot in the road, and collapsed to consider our options. Night was falling. My bike’s headlight was aimed at a point in the lower stratosphere. Judy’s bike had very little transmission and no clutch left. Alan had no front brake. The Jeep was running on its spare tire, and had only just made it past some of the rougher spots in the road. We had no idea where we were, or how far away we were from pavement (let alone civilization). So Norachai and Choo scouted on ahead in the jeep to find a pickup truck into which we could load the disabled motorcycles. There is one vision that even the most stoic adventurer dreads. It is the sight of your rescue vehicle leaving the scene without you on board. Leaving you behind in the trackless jungle. Surrounded by unknown creatures of unknown inclinations. It was a little creepy. So we did the only thing one can do in that situation. We started playing poker, using rocks as chips. Oh yeah, we also built a bonfire, which we started by dipping a Kleenex into the gas tank of one of the bikes. Nancy stoked it for hours. The stakes of the poker game where: whoever won had to go collect firewood. Jacks, Queens, Kings and Aces were wild. Alan was first bidder and folded immediately, without looking at his cards. Judy and I folded instantaneously after that, making Alan the first folder therefore (by popular vote) the winner of the game. Grumbling something about the rules of poker, he went off looking for firewood. He soon returned dragging an entire fallen tree. We settled in to enjoy the fire and the zillions of stars that hung in the cold sky just beyond arm’s reach. 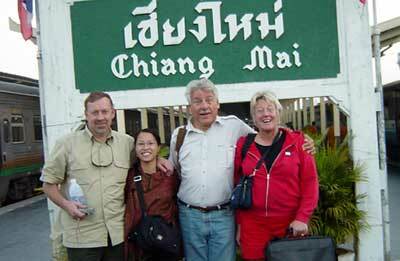 The team (minus Norachai) arrives in Chiang Mai from BKK - (L to R) Alan Crawford, Nancy Paez, Cliff Bamford, Judy Weber. In the mountain tribe village where we entertained locals - Nancy Paez and local children. At the village where we stopped for lunch we met the old woman with the good sense of humor who wove fabric, whom we took on a short chopper ride to the newly opened municipal crafts center. A few hours later, Norachai and Choo returned with the Jeep AND a pickup truck. Salvation! We gently shoved the disabled bikes onto the pickup and tied them securely with a web of ropes, so they could not possibly fall over. We collected our stuff. Choo jumped aboard the remaining operational bike. The rest of us jumped into the vehicles and off we went in a cloud of dust and high spirits. For 20 meters, until one of the bikes in the pickup fell over, causing more damage to itself and the other bike than 500 kilometers of mountain roads ever had. Oh, well. This happened a couple of more times, since the road to salvation was just as rocky as the ones we had already traversed. Finally, we just let the bikes seek their own level and stopped fighting the inevitable. After a ride that lasted hours and turned Choo into a human icicle, we arrived at Norachai’s charming B & B cottage in Mae Sariang. Words cannot express how wonderful a hot shower and a soft bed felt. The next day, we had regained a little of our adventurous spirit. 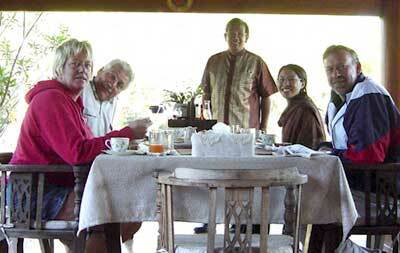 We had breakfast on the boardwalk over the lovely pond Norachai had created on his property. We fed the fish. Overnight, most of the vehicles had been repaired and cleaned, so we took off again to Mae Hong Son where we boarded a long tail boat and went for a visit to the Karen long neck village there. Then we headed back to Chiang Mai. This time, we adhered to the pavement. We are all safely home now. Life is quiet, comfortable, and perfect. Without Norachai and his astonishing organizational abilities, this trip would have remained a pipe dream. Norachai found Choo, our guide, one of the best we’ve met in our travels far and wide. Both of these excellent gentlemen defined great grace under great pressure. Sincere thanks for orchestrating an experience we’ll never forget. Sincerely, Judy Weber, Nancy Paez, Alan Crawford and Cliff Bamford. Chiang Mai Ballet Academy recently celebrated receiving His Majesty King Bhumibol’s award for the most outstanding academy in community relations, a feat they achieved last year. The award was both for the academy and its director, M. L. Preeyapun Sridhavat. M.L. Preeyapun Sridhavat, director of the Chiang Mai Ballet School. Chiang Mai Ballet Academy students perform at the celebration party for M.L. Preeyapun. 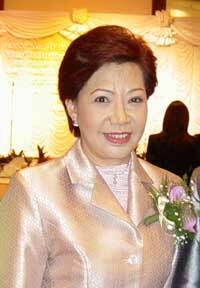 The celebration party was held at the Imperial Mae Ping Hotel on Sunday, March 30, and was also organized to recognize M.L. Preeyapun receiving the award from Singapore for women working in the creative arts in the Asia-Pacific region (also last year) and for her being appointed in Chiang Mai as the Honorary Consul for the Republic of Peru. Thai Applied Ballet students perform at the celebration party for M.L. Preeyapun. 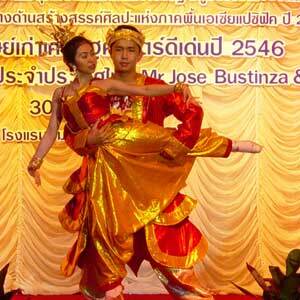 Thai Applied Ballet harmoniously combines Thai and Western influences. 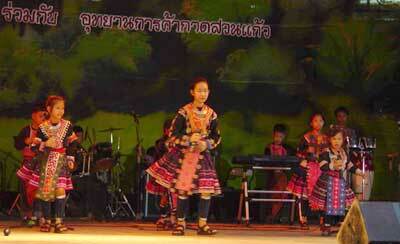 The celebrations included performances by students of the academy with Thai dancing and Thai applied ballet. This year’s 28th Mahakam Larb Muang Festival, and Miss Thida Larb Beauty Contest was held successfully on April 5 at Kad Suan Kaew, with more fun and excitement than ever before. It’s been really impressive for those attending the event. Indeed difficult to choose - the 3 winners, Varanya Sirichan, Ms Juthamas Maijai, and Daisy Vogt. 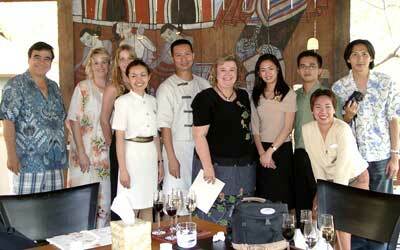 The Chiangmai Mail’s Larb cooking team enjoys the competition. With a little help from our friends —Amari Rincome’s Executive Chef Adrian and his staff were on hand to support the Chiangmai Mail Team with beautiful fruit carving and flower arrangements. Chiangmai Mail reporter Daisy Vogt won the first runner-up for the Miss Thida Larb beauty contest and also the Miss Popular Vote, winning prizes worth more than 15,000 baht. The local fair started at noon on Saturday, when dozens of representatives from almost 50 groups and organizations, all mainly from the Mass Media organizations of Chiang Mai, registered for the Larb Northern Food contest as well as the Miss Thida Larb Beauty Contest. 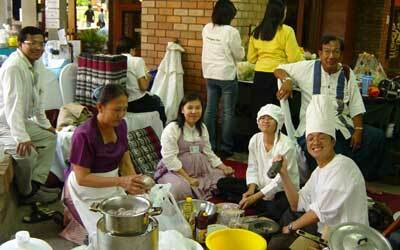 After registering their teams, most of them started to prepare the meats and ingredients for cooking the Larb. After the preparations where done they started cooking, each in their designated area, while the local Thai Slor Sor Sueng instrument band played on the central stage in the background. The Chiangmai Mail team worked friskily and efficiently to prepare the Larb, while staff from the Amari Rincome helped by carving some beautiful decorations in order to decorate the platter for the Larb competition. Noke Lae band entertains festival goers. 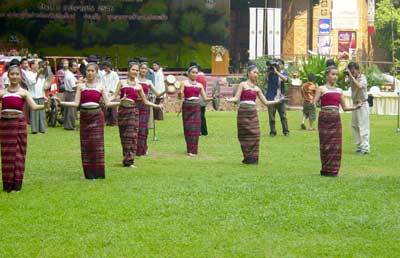 Girls from Ban Roi Chan performed a “fingernail” dance to welcome visitors. Chiangmai Mail’s Larb entry is ready for judging. 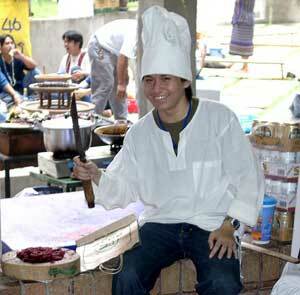 Is it a smurf, one of Chiangmai Mail’s reporters, or a chef? Two out of three is not bad … it’s Supatatt! Fun, and having fun, was the name of the game and when walking through the huge ground of the Kad Suan Kaew Garden it looked like all teams achieved this. Before the beauty contest began, Larb Nian and Larb Leela cooking competitions took place on stage, followed by the opening ceremony, which was presided over by Udornphan Chantraviroj, the president of the Chiang Mai Provincial Administration Organization, who beat the gong, the local symbol of victory. He was accompanied by his PAO team members, who were welcomed by a “fingernail” dance performed by girls from Ban Roi Chan. 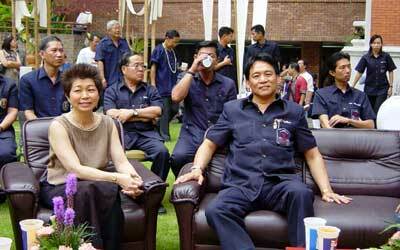 This event was organized by the Chiang Mai Press Cub’s chairman, Thani Suwattana. Music was presented by the Kavila band from the 33rd Military Circle, and the famous northern Noke Lae musical band, Suntaree Wechanond. For the beautiful ‘Miss Larb Competition’, Daisy, Chiangmai Mail’s own Miss, was beautifully transferred from a blond European girl to a blond Thai, by beautician Addy Beaute, who is very well known in Chiang Mai beauty circles. Also, the judges were impressed that the only farang ever to compete in the 28-year history of this event spoke very clear Thai, mixed with some northern phrases. 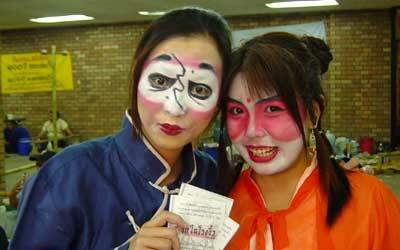 Some of the event participants made themselves up in Chinese fancy style. Ms Tassanee Sungkerd (seated left), assistant MD of Kad Suan Kaew shopping complex, and Udornphant Chantaraviroj (seated right), the president of Chiang Mai Provincial Administration Organization enjoy the proceedings. Ms Srinakorn Srikaew (left), and Panlika Chaiyasri (center), from the Amari Rincome Hotel, and Ampai Kuntawong (right), Chiangmai Mail reporter trainee at the scene. The Larb Nian competition goes full speed ahead on the stage. All 28 contestants walked onto the big stage, posed for pictures, walked again and waited, while music groups and children dancers took over the stage. It was very exciting when all the Misses came out again, waiting for the call of the last 10 who were then interviewed by the MCs of the day, Therdsak (Tong) Jiamkitchwattana and Ms. Pikulthong (Nong Nat) Jiamkitchwattana. 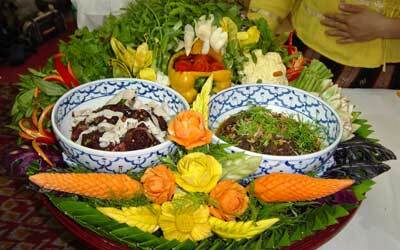 Questions were asked and answered about the North, about Thai culture and of course about the preparation of Larb. You could see the crowd waiting for the questioning of the ‘Farang’ - but what a surprise- she spoke Thai! This probably won the hearts of everyone, since she became not only the 1st runner-up but also voted ‘Miss Popular’. Well done! 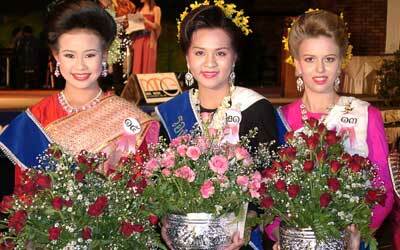 In the end, Varanya Sirichan from Vihoksaifah Newspaper and Chiang Mai Reporters Club was crowned Miss Thida Larb 2003. As mentioned, Daisy Vogt of Chiangmai Mail Newspaper was the first runner-up, and Ms Juthamas Maijai from the TV Channel 11 Sawasdee Muangthai TV program and Northern Mass Media Club finished second runner-up. Meanwhile, the winner of the Larb cooking contest in the amateur category was a team from Thai Rath mass-circulated newspaper. The first runner-up was a team from Mac Media Chiang Mai Co and the second runner-up was the Spirulina team. In the Larb professionals category, the winner was Xin Sia Yer Bao Newspaper, the first runner-up was Khum Khantok Restaurant, and the second runner-up was Lotus Pang Suan Kaew Hotel. A birthday party it certainly was: The Sheraton Grande Sukhumvit celebrated the second anniversary of its award-winning Sunday Jazzy Brunch at the end of last month, with a ‘full house’ which packed the Living Room, enjoying the jazz, the sumptuous buffet, wine and the usual fun and games - for the young and old. GM Richard Chapman welcomes the Jazzy Brunch aficionados. Bob Kervorkian cuts the birthday cake; Richard looks on. Like any birthday, there was a special cake and General Manager Richard Chapman called on the hotel builder, well known man-about-town Bob Kervorkian to cut it, brandishing a huge sword. 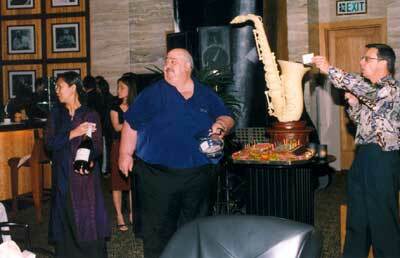 Magnums of champagne, a two-night stay at the Sheraton sister hotel in Phuket and a “super special” massage at the Grande Spa went to lucky winners among the many who placed their cards in Richard’s famous glass bowl for the draw, also undertaken by Bob who had the magnanimity to leave his own card aside. But there were even more winners, when Richard announced that through the month of April, all diners at the Jazzy Brunch could look forward to free wine included. At under 1,000 baht, this is undoubtedly the best dining value in town. With or without wine, the new buffet at the Sheraton is indescribable, with table after table of an amazing array of fare promptly swooped upon by the guests. 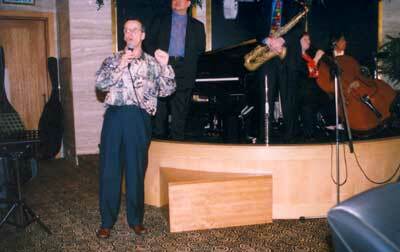 The famous Sheraton glass bowl: Bob Kervorkian draws the winners. Richard announces. Jeremy Monteiro, the first jazz musician to be awarded the “Cultural Medallion of Singapore” - just recently - regaled the crowd with his Super Quartet - a fitting tribute to the birthday “child”. - A 55-minute massage per person per stay. A minimum two-night stay is mandatory, with the choice of the Deluxe, Single 3,999 baht (plus service, tax), Double 4,999 baht (plus s/t); Executive Suite Single 7,999 baht (plus s/t), Double 8,999 baht (plus s/t). Conditions apply and the offer is only open to Thai residents. For reservations and/or more information Tel. (66) 02 653 1070; fax: (66) 02 653 0407; e-mail: <reservations. [email protected]> In all correspondence quote rate code “Songkran”. This week was just too hot to tour the surroundings of Chiang Mai, but having my daughter around for the university holidays, we decided to do a ‘mother-daughter’ cooking class. And doing something as a ‘treat’, it has to be done in style. Where else but at the Regent? The Regent Cooking School is a well equipped, beautifully designed stand-alone facility, built in Lanna style with its own herb garden and an outdoor dining venue. We were greeted by Miss Kanittha, the Cooking School coordinator, and the always caring and friendly Miss Sangwan from the PR department. All smiles are <from left> Nomjit Soungvichaiphonkun, PR & Customer Services, Passport to Suvannaphoum Magazine, Pitak Srichan, The Regents’ Thai Cuisine Chef, Somock Inthavong, The Regents’ Resort Manager, Jirann Siri, MD Passport to Suvannaphoum Magazine. Having received their individual licenses to cook, all participants posed just after the successful completion of the class. At the Regent Cooking School, every session begins with a traditional Thai spirit house blessing in the morning to please the spirits so they will watch over the house, the area and, of course, our cooking. Our group for that day was mixed, Thais and Farangs, experienced cooks and novices alike, all with the desire to get a one-of-a-kind introduction to Thailand’s fascinating culture and world-famous cuisine. Our chef and teacher for the day was Khun Phitak, who started cooking at the age of 18 and traveled the world, getting his experience in the Middle East, Saudi Arabia, Libya, Germany, Malaysia, Iceland and of course in Thailand. We were all seated around a huge stove, one of these dream kitchens everyone would love to have in their own house, including the helping hands to clean up after. We were more than impressed by the wood and stone appliances, by the over-dimensional extraction fan with built in lights. The small architectural details showed that no expense had been spared in creating an environment that is not only inviting for the ‘student’ but also an open aired, fun place for the cooks to show off their skills. Not bad for a start - and absolutely edible was the result of the half-day event. 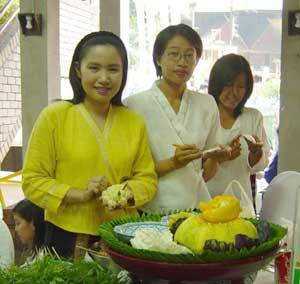 Have you ever seen the golden Krathong mold? 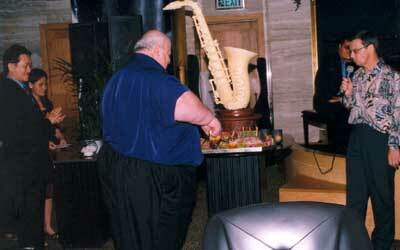 We had a personalized program, made up of 5 different items, which eventually added up to a full 5-course meal. 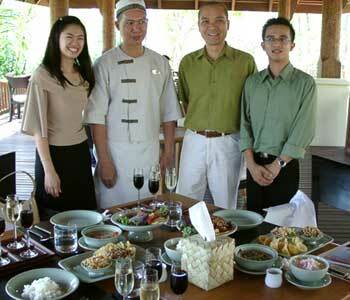 Starting with the appetizer, our chef had chosen to teach us how to make a banana blossom salad. This yielded an interesting and inquisitive taste, and let me tell you, the next time we have a banana blossom in the garden, it will end up in a bowl. After tasting our salads and comparing them to the taste of the chef’s, we continued on to the next course which was the famous tom kha kai, or spicy chicken soup with coconut milk, followed by kaeng kiew warn moo, or green curry with pork in coconut milk. Both dishes were ethereal to our taste buds and a lot simpler to make than any of us had imagined. Now, since we had already learned to make the appetizer and main-dishes, our chef explained that we needed some snacks to serve between the courses, which led us to prepare chicken and shrimp tartlets. The tartlets, or golden krathongs, were made beforehand, and we all had a chance to try out the traditional golden krathong mold. I guess dipping the ‘krathong thong mold’ in the hot oil, counting the seconds until the batter was golden, then trying to shake it off again was the fun part and more than once we giggled and laughed and clapped our hands. It was a typical case of adults becoming childish again but a good laugh for everybody. For the fillings we were once again allowed to go to our own workstations and make the two different fillings, one sweet and one spicy. 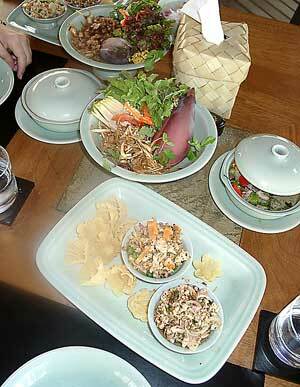 The larb, or minced spicy chicken salad, was my personal favorite and I’m sure I will be making it again soon. 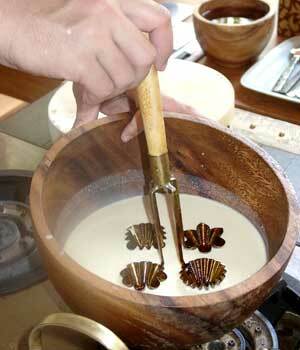 Last but not least the dessert was made, this ended up being tapioca with water chestnuts in coconut milk. Usually sold on the market and made very sweet, we were now allowed to flavor it according to our desire and for those people with a sweet tooth this was a very rewarding experience. Since we had now completed our five courses and didn’t have to worry about cleaning up the kitchen or washing the bowls, woks and saucepans, everybody gathered on the terrace next to the cooking school and ate their own creations. During this time a wine tasting was also held, 2 white wines, a beautiful light 2002-Sauvignon Blanc Echeverria from Chile and 3 most tasteful Thai wines; a white and a red wine from Khao Yai, a Sauvignon Blanc 1999 and a very fruity and full 1999 Shiraz reserve. After having also tested the red Shiraz, Chateau de Loei 2002, we agreed that this day at the Regent Cooking School was not only enjoyable but also effective and rewarding in every aspect. On the twenty first of February, a group of twenty foreign exchange students from the United States, Germany and France visited The Dhamma Park Gallery and Heritage Gardens in Pasang, Lumphun Province. 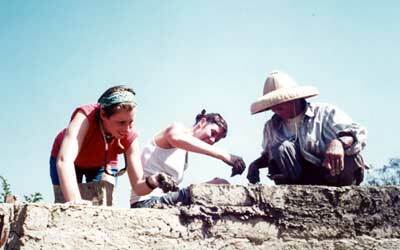 Payap University Thai Studies students learn how to mortar adobe bricks with the help of a local expert. 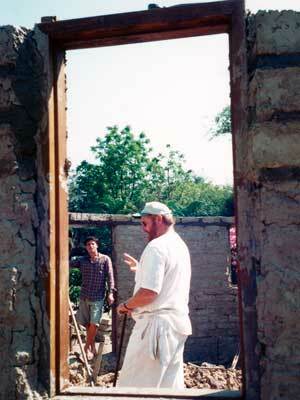 Ajarn Barry Wheeler explains adobe construction principles to Thai Studies students. The students from Payap University’s Thai and South-east Asian Studies Program were welcomed to Dhamma Park by its director, Venetia Walkey (Vanida Wongsam), an expatriate English artist and peace builder, wife of National Thai Artist, Khun Inson Wongsam. They are both sculptors. The students were introduced to Walkey’s contemporary Buddhist sculptures, which present the epic psycho-physical journey from Ignorance to Enlightenment with both humor and satire. They are arranged round an eight meter high Fountain of Wisdom in the center of the gallery. There the students were offered an opportunity to meditate and reflect on the meaning and purpose of life. In the garden the students also encountered and played on many colorful sculptures that Khun Inson created as imaginary machines to clean up environmental pollution under the sea, on land, and in the air. The students helped to build a mud brick house and to spin and weave cotton grown in Heritage Gardens. This cotton is part of the project to bring back its cultivation to this region and re-link the younger generation to their ancestral traditions, traditional tools, natural dyes, organic fertilizers and natural pesticides. 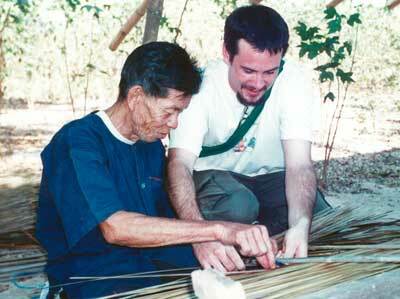 The students also tried their hand at weaving grass thatch, another traditional skill that is in danger of dying out. These are survival skills which are essential for villagers around the world. Learning to spin cotton fiber on a traditional hand-made spinning wheel is a valuable experience. Thatching is done with dried elephant grass, twine, and long strips of bamboo. Mahatma Gandhi was chosen as an icon for Dhamma Park’s Cotton Field Project. He led India peacefully to freedom from British rule in the early twentieth century. 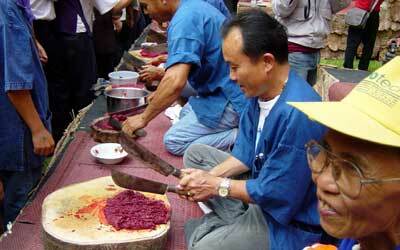 He taught these skills as part of the Buddhist philosophy of sustainable self-reliance. Gandhi emphasized the development of right conduct for those who wished to change society. Gandhi’s philosophy is in accordance with His Majesty The King’s speech on December 5th 1997, urging the Thai people to become more self reliant through sustainable living. Barry Wheeler, a Thai Studies professor of appropriate technology for sustainable rural development and Mary Griep, an associate professor of art from Saint Olaf College, Minnesota, U.S.A., guided the student’s experiences at Dhamma Park. One of the main goals of Dhamma Park is to serve as a center for Socially Engaged Buddhism and the Arts. This goal can be achieved by raising the level of spiritual and environmental consciousness of visitors and to rekindle personal interest and pride in traditional skills that are both useful and environmentally appropriate, in addition to being beautiful. Dhamma Park’s staff and local experts were present to demonstrate and assist the students in weaving, spinning, mud brick making, and grass thatching. The Cotton Field Project (in which students from five primary and secondary schools in the districts of Pasang and Lumphun took part) is supported by the funding committee for the Development of Community Projects for the Province of Lumphun. This project is part of the committee’s policy to bring back local wisdom. The 9th ASEAN Art Awards will be held in Thailand next year and organizers are seeking five artists to be Thailand’s representatives. This competition is a stage for artists to display and show their creativity. There will be participating artists from eight Asian countries - Brunei, Philippines, Indonesia, Singapore, Malaysia, Myanmar, Vietnam and Thailand. Organizers meet the press at Chiang Mai University Art Museum. Winning the final round of judging of the 40 entries will net the winner USD 15,000 (B. 600,000), and 5 runner-ups will receive USD 5,000 (B. 210,000). This final round will be held in midyear 2004. The Thailand/ASEAN Art Awards will take place at the National Museum of Art in Bangkok this August to select representatives. The Thailand winners will receive a B.125,000 prize and trophy. The winning art pieces will be shown at the Art Exhibition August 6-24 at Bangkok and December 10-30 at Chiang Mai University Art Museum. To enter, participants must be of Thai nationality and send in their art piece 2x2 meters in size including the frame, and not weighing over 30 kg. More details are available from the Fine Arts Faculty, Chiang Mai University, telephone 053 944 836. Private and government organizations and the Philip Morris (Thailand) Company are involved with the awards as hosts and sponsors.